This holiday don’t throw the ole traditional ‘cook-a-turkey’ dinner. Throw a party where both kids and adults can give thanks by having a Mega-Bash! Sure, tradition is important but while the bird is in the oven, or after watching some football, why not have a little family fun by renting one of our party favors or inflatables. This blog tells you how to turn your Thanksgiving into a Fun giving Mega Bash! Obstacle courses are extremely popular. These are a bit large and will need some additional room, but, when there’s room, there’s a ton of fun. If you step out of the traditional Thanksgiving feast and throw a huge barbecue at one of the parks, our Blue Lagoon or Radical Run can help burn off that deep fried turkey in no time. Fun for both kids and adults and ideal for South Florida weather. These can be used as wet or dry exhibits. Next, every party is complete with mashed potatoes and a bounce house. 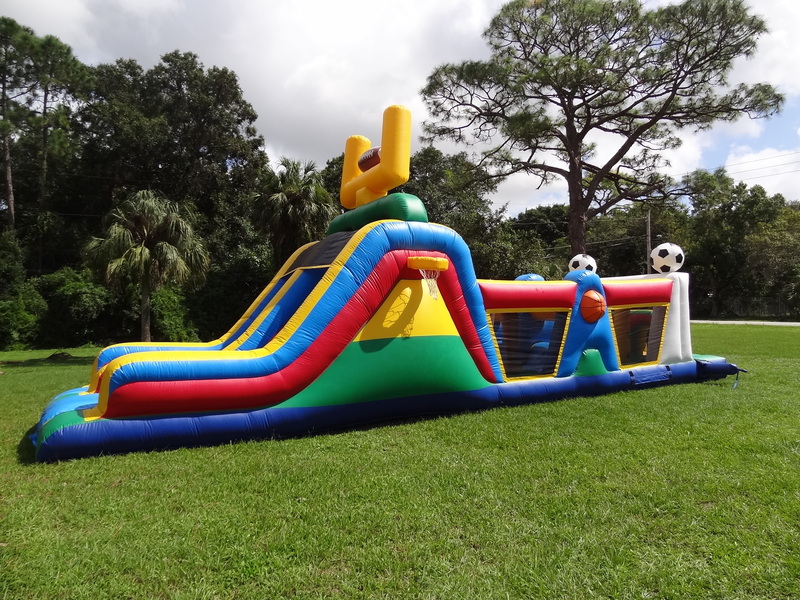 Our inflatables come in a variety of sizes and we can assist you if you’re unsure of what works per age range. What the children’s age, this is one awesome time after you’ve finished the dessert. If you’ve got a larger party coming than originally planned, don’t worry. We have a full selection of folding tables and chairs for the extra people coming to join you for some pumpkin pie. If you’ve got something planned for outdoors and want to stay protected in the Florida sun, ask us about our tents. Whatever your last-minute needs are, we’ve got you covered. Looking to entertain the adults as much as the kids this season? Try out some of the interactive sports. Keep hungry kids out of the kitchen and get them rolling around with our Zorb Balls or shoot some pool with our Human Billiards game. We’ve got a little something for every pilgrim or Indian on your list. Make this year’s Holiday parties a hoot with fun and exciting party favors keeping the good times rolling. There’s plenty of time to get in your last-minute details. Contact our staff today, for a smashing good time!